2-7-2007: Do not Call the Illustrious Nation of Aramaeans by the Misnomer 'Assyrians'! The Historian Poseidonios from Apamea (ca. 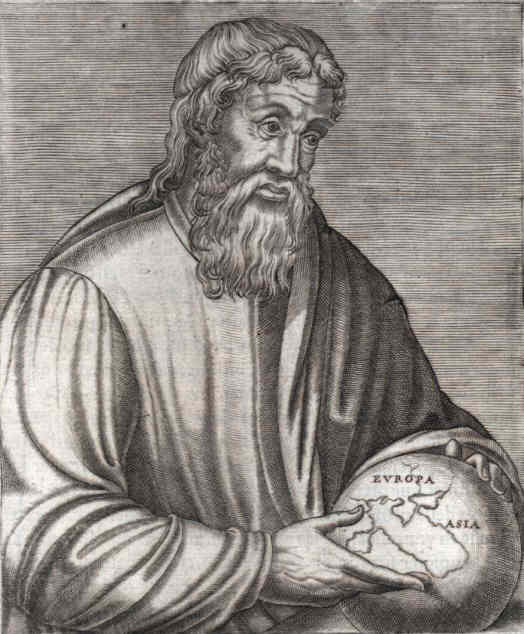 135 BC - 51 BC), was a Greek Stoic philosopher, politician, astronomer, geographer, historian, and teacher. He says: "
"The people we Greek call Syrians, they call themselves Arameans"
He says: "Poseidonius conjectures that the names of these nations also are akin; for, says he, the people whom we call Syrians are by the Syrians themselves called Arameans." 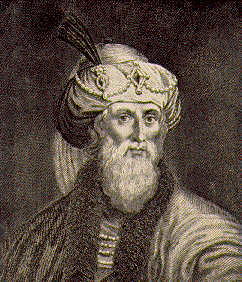 Flavius Josephus (c. 37 – c. 100 AD (or CE)) was a 1st century Jewish historian and apologist of priestly and royal ancestry who survived and recorded the Destruction of Jerusalem in 70 and later settled in Rome. He says: ""Aram had the Arameans, which the Greeks called Syrians."" 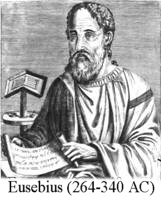 Eusebius of Caesarea (c. 275 – May 30, 339), was a bishop of Caesarea in Palestine and is often referred to as the father of church history because of his work in recording the history of the early Christian church. He says: ""and from Aram the Arameans, which are also called Syrians"
Abu Al-husayn 'ali Ibn Al-husayn Al-mas'udi, born 895 in Baghdad [Iraq] and died 957 in al- Fustat [Egypt], was a historian and traveler, known as "the Herodotus of the Arabs.” He was the first Arab to combine history and scientific geography in a large-scale work. On Tur Abdin he says: "Tur Abdin is the mountain where remnants of the Aramean Syrians still survive." 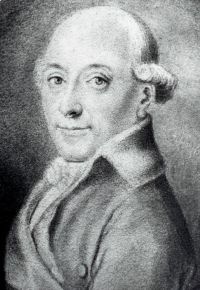 Prof. Dietrich Hermann Hegewisch born Dec. 15, 1746 in Quakenbrück [Germany] and died April 4, 1812 in Kiel, was a prolific german historian at the University of Kiel with a wide span of interests. He says: "Do not the Syrians, as they are usually called, or the Arameans, as they in fact are termed, deserve more attention in world history than they are usually given?" On Page 197 he says: "The names Syria, Assyria, Mesopotamia, Babylon, etc. stem from the Greeks, who were not familiar with the true geography of these lands when the names first started to be used. Later, partly because of continuing ignorance and partly because of convenience despite having accurate knowledge, they persisted in using them since it would have required something of an effort to give up the old, familiar names and divisions of the countries and switch to the new ones, even if they were more accurate. The old, true, and single name of these lands is Aram; it is mentioned numerous times in the Bible of the Old Testament, and Greek scholars were also familiar with it and probably described the population of these areas as Arameans, though seldom, as they usually continued to use the term Syrian, which had been familiar to the Greeks." On page 307 he says: "The Syrians or Arameans were not merely a numerous and large people, they were also a much cultivated people." 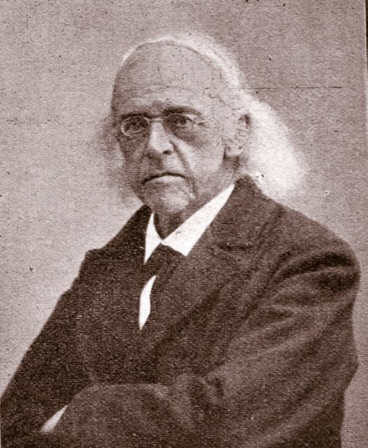 Prof. Theodor Mommsen born Nov. 30, 1817, Garding, Schleswig [now in Germany] died Nov. 1, 1903, Charlottenburg, near Berlin, was a German historian and writer, famous for his masterpiece about the History of Rome. He received the Nobel Prize in Literature in 1902. He says: "the history of the Aramaean or Syrian nation which occupied the east coast and extended into the interior of Asia as far as the Euphrates and Tigris"
"the Arameans defended their nationality with the weapons of intellect as well as with their blood against all the allurements of Greek civilization and all the coercive measures of eastern and western despots, and that with an obstinacy which no Indo- Germanic people has ever equalled, and which to us who are Occidentals seems to be sometimes more, sometimes less, than human." 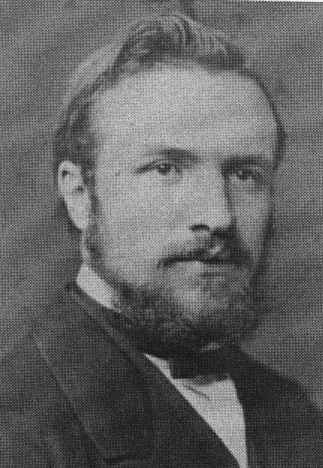 Prof. Theodor Nöldeke born March 2, 1836 in Harburg near Hamburg, died December 25, 1930 in Karlsruhe, was the leading german semitic scholar, who studied at Göttingen, Vienna, Leiden and Berlin. He says: "The main body of the population of all these wide landscapes from the Mediterranean Sea to beyond the Tigris belonged to a certain nationality, that of the Arameans." On page 461 he says: "It is well understandable that people have started to transfer the name of the country to the most important nationality and so the name 'syrian' was apprehended ethnological and was equated with 'aramaic'." On page 468 he says: "Since the times of Alexander [the Great], if not already somewhat earlier, people have started to transfer the name of the Syrians exclusively over the prevailing in Syria nationality, and in this way this originally political-geographical term became an ethnological one that was identified with the local Arameans." Karl Eduard Sachau born 20 July 1845 and died 1930 was a German orientalist. He was 1872 professor at the University of Vienna, and in 1876, professor at the University of Berlin, where he was appointed director of the new Seminar of Oriental languages in 1887. 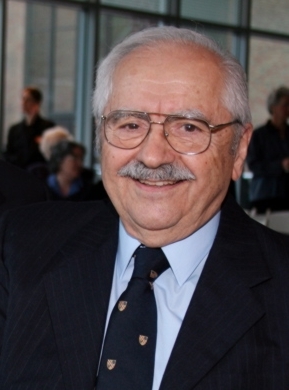 He is especially noteworthy for his work on Syriac and other Aramaic dialects. He says: "The nation of the Arameans: This national name later, mainly in consequence of Jewish-Christian literature influences, gave way to the Greek designation Syrians." (Please be informed that in our days the nationalistic/fanatics, the colonial illuminati product "Assyrians", try by all means possible to distort our rich heritage by stating that the word “Syrian” is abbreviation of “Assyrian” and hence they label all the Aramean denominations wrongfully and in contradiction to the historical facts as “Assyrians”. The area where the Aramean people come from was known as “Mesopotamia” and has been divided into the modern countries Iraq, Syria, and Turkey since the 20th century. In the ancient times the cradle of the Aramean forefathers was called Aramnahrin (or: Aram-Nahrin) in Aramaic. In Hebrew it was called Aram-Naharaim which we encounter in the Old Testament. When the Old Testament was translated into Greek, the term Aram-Naharaim was translated into Mesopotamia, which many become familiarized with through reading many educational and historical texts. Roughly speaking, this area is situated in present south-eastern Turkey/northeren Syria. The northern area of Aram-Naharaim was called Paddan-Aram, meaning the land of Aram where Biblical figures like Abraham and Jacob lived and walked. A section of Paddan-Aram is now called Tur Abdin in the Aramaic (Syriac) language, which means “the mountains of the servants of the Lord”, due to the overwhelming presence of monasteries and churches. According to the Aramean historical traditions, the area of Paddan-Aram- in particular ‘Tur Abdin’ – is the proto-land of the Aramean nation. From this proto- or indigenous land, in the course of time, the Arameans started to expand all over the near east. After the coming of Jesus Christ, the Arameans (including Assyrians and Chaldeans) of Aram-Naharaim accepted the teachings of Christ and established together with the apostles of Yesuh M'siho and the converted Jews, the Syrian Church of Antioch, the second Patriarchy after Jerusalem, where for the first time the followers of Yesuh M'siho were called Christians (Acts 11:26). This church was the mother of all the Churches and the first Church established outside Israel, whose Patriarch currently resides in Damascus, Syria. The Semitic Arameans (‘not to be confused with “Armenians”) underwent a change of name after they had embraced Christianity and were then called “Syrians” for unknown reasons. Some say to distinguish from the Arameans who were not converted to Christianity, while others say that when the Greek Empire expanded into the region, they called them “Syrians”, because the Greeks were not familiar with Arameans. The Arameans of the Old Testament are called “Syrians” in the New Testament. In other Bible translations however, the Arameans of the Old Testament are called “Syrians” in the New Testament. The designation “Syrian” should not be confused with the present-day Arameans of Syria who identify themselves as “Arabs”, following the wicked colonial activities of France and United Kingdom. In deeper sense however, the name "Syrian" belongs to the Aramean nation and not to the “Arabs” invaders. However, after the conquer of Mesopotamia by “Arabs”, they adapted the name "Syrian"; with the result that the real Syrians, that is to say: Arameans; became strangers in their own indigenous lands. The Arameans were spread throughout Middle-East and were termed as East- and West- Arameans. This has to do with the geography at the beginning of Christianity. Roughly speaking, river the Euphrates was de border. The Arameans living Eastern of Euphrates, the Persian Empire, were called “East- Arameans” or “East- Syrians”; thus Nestorians who later became known as “Chaldeans” (1552) and again later as “Assyrians” (19th century). The Arameans living Western of Euphrates, the Roman/Byzantine Empire, were called “West- Arameans” or “West- Syrians” or in short just “Syrians”. And sometimes both the East- as well as the West- Arameans are called “Syrians”; if not specifically indicated! The Church in the Roman Empire: Syrian orthodox church of Antioch; the mother Church; with Antioch as the Ecclesial Jurisdiction. The Church in Persia: The Church of the East or the Church of Persia, Seleucia Ctesiphon as the seat of the Catholicos. However the Arameans in Persia were still under the jurisdiction of Antioch until 424 Ad. There are in Syria two villages called Jubb ‘Addin and Bakh’a (50 km from Damascus) where the inhabitants are Moslems. 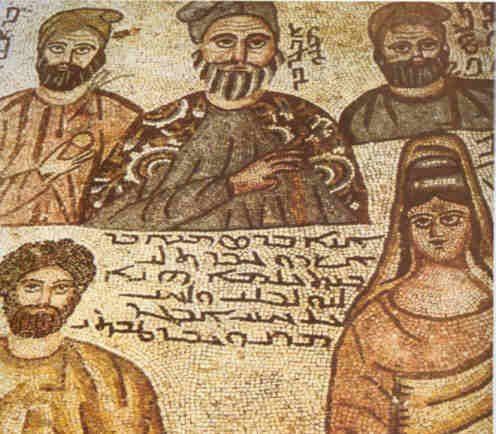 These Moslems speak Aramaic and are aware of their Aramean origin. They are so proud of their Aramean origin that they even translate songs from other languages into Aramaic and maintain their customs and traditions. However, other Arameans who converted to Islam and did not maintain their Aramaic language, adopted Arabic and hence are called in our days "Arabs". These "Arabs" are not Arabs in the sense of their ethnicity, but rather because they have adapted Arabic. Thus they are linguistically "Arabised", not ethnically! In short: There are millions of Islmaic Crypto-Arameans in the Middel-East who go by the names "Arabs", "Kurds" or "Turks." Below, we present you the testimonies of scholars of all the Aramean denomination regarding their awareness of their Aramean origin. 14. 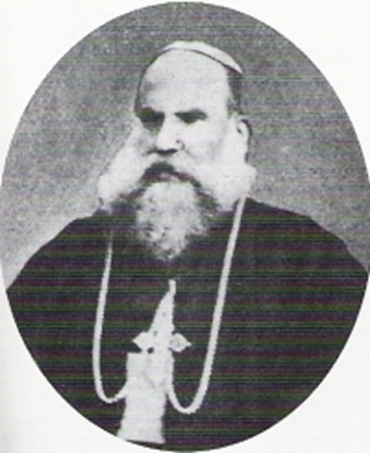 Clemens Joseph David, born 1829 in Amadiye [Iraq] and passed away in the year 1890, was ordained Archbishop of Damascus in 1879. 10. Isho'dad was a native of Merv (Turkmenistan). 1. مار أفرام السرياني (373†)، وهو قيثارة الروح القدس ، والأب الشهير للكنيسة السريانية الأنطاكية، وهو يذكرعن بار ديسون الشهير (154-222 م.) " بار ديسون الفيلسوف الآرامي"
1.2.1. "But the philosopher of the Arameans made himself a laughing-stock among Arameans and Greeks"
1.2.1. "أضاف "لكن الفيلسوف الآرامي جعل نفسه عرضة للسخرية بين الآراميّين واليونانيين. 1.2.2. "Because 'light' in Aramaic language is called as masculine, and 'eye' feminine in the same"
1.2.3. وهو،( بارديسون)، دعا القمر مؤنّث في اللغة الآرامية"
"Doctor who in his mercy healed the girl which is the daughter of the Arameans, heal our souls." 1.4 عن يسوع المسيح وشفاء إبنة المرأة الكنعانية يقول في طلبته إلى الرب [1.4]: الطبيب الذي برحمته شفا الفتاة التي كانت إبنة الآراميين؛ إشفِ نفوسنا"
_ "This (Efrem) who became a crown of glory for all the Arameans, and through him they became near the spiritual splendors. He who became a great orator among the Syrians." _“He who raised up the horn of the Syrians everywhere, (and) from him henceforth we have learnt to sing to the Lord with sweet songs"
Z هذا (أفرام) أصبح تاج العظمة لجميع الآراميين ومن خلاله إقتربوا من العظمة الروحية. وكان خطيب كبير بين السريان". ونحن منذ ذلك الوقت تعلمنا منه أن نرتل للرب التراتيل الحلوة والهتافات". _"He who gazed diligently in his mind on the great Moses, and after the model of the Hebrew women he taught the Aramaean women to give praise with their madrashe"
Z وبذهنه الحاذق تأمل في موسى العظيم وفي نموذج النساءالعبريات وكذلك علّم نساء الآراميين لكي يسبّحن الله في ترانيمهنّ". 2.1.1 "[The Patriarch] Jacob and [the apostle] Aday were sent to Aram-Nahrin, so that they would fulfill both the New and Old (Testament words)." 2.1.1 "[ البطريرك] يعقوب و [الرسول] آداي أرسِلوا إلى آرام ما بين النهرين، وفاءً لتنفيذ كلمات العهد الجديد والقديم"
2.1.2 "Aday himself, too, came to the land of Beth-Oromoye, so that these symbols drawn by Jacob would be fulfilled through him. And (so) in Urhoy he opened up a big fountain of living waters." 2.1.2 "آداي نفسه أيضا جاء إلى بلاد ما بين النهرين، لكي تتحقق الرموز التي رسمها يعقوب من خلاله. وبالتالي فتح في الرها (أورهوي) ينبوع كبير من المياه الحية"
"The daughter of the Arameans, albeit aloof, heard his lore"
"إبنة من السريان الآراميين، رغم أنها كانت مترددة، استمعت تعاليمه". 2.4 In the Homily on “Guria and Shamuna” the martyrs from the neighborhood of Edessa (Urfa) and says[2.4]: "Two precious pearls, which were an ornament for the bride of my lord Abgar, the Aramaean's son. 2.4 في عظة عن "جوريا وشامونة" (Guria en Shamuna) الشهيدتين من أطراف الرها يقول[2.4]: اللؤلؤتين الثمينتين اللتين كانتا زينة لعروس سيدي أبجر، إبن الآراميين"..
3.1. "In both scholastics they were educated; in Aramaic, which is Syriac and in Greek, which is called roman." 3.2. "In that time they learned to proceed the sciences in this scholastic Aramaic, that is to say Syriac." في هذه اللغة الآرامية المدرسية، أي السريانية". 3.3. "After the flood in the days of Noah, the Arameans inhabited Beth Nahrin." 3.3 " بعد الطوفان في أيام نوح ، الآراميون سكنوا بلاد ما بين النهرين". 3.4. "Many of the children of Aram were educated in the Greek language." 4.1. "In the days of Catholicos Babai heresies of the disciples of Paul from Samosata and Diodor from Tarsus emerged in the country of Beth Oromoye"
ظهرت في البلاد بيت أورومويى بُدع تلاميذ بولس من سموساتا وديودوروس من ترسوس"
4.2. 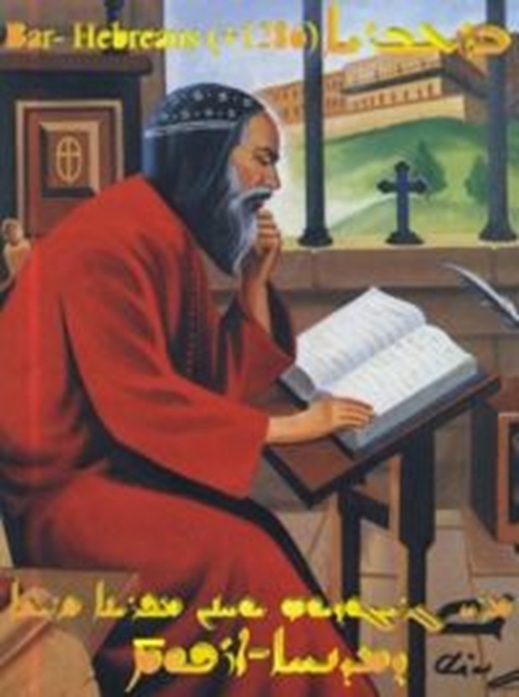 About Mor Benjamin, he says “Mar Benjamin the Aramean, who later became the abbot of the school in the village of Daira, which (lies) in the diocese of our monasteries." 4.2 عن مار بنيامين يقول: "مار بنيامين الآرامي، الذي أصبح فيما بعد رئيسا لمدرسة القرية الدائرة، التي تقع في أبرشية ديرنا"
5. 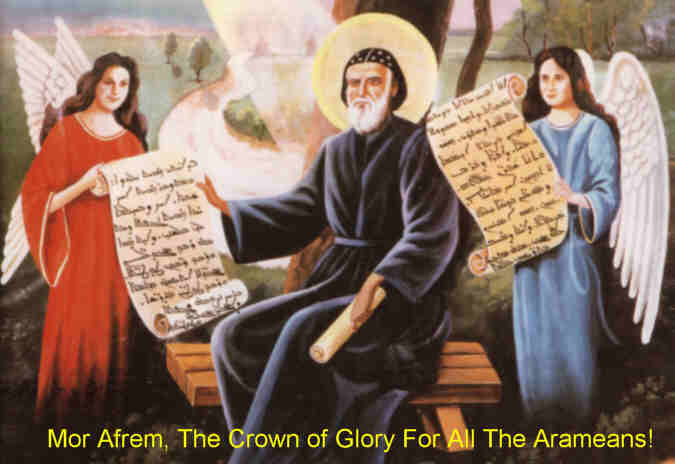 Patriarch Severius of Antioch, also known as de Crown of Syrians (†538, Egypt) says in one of his writings  “"It is in this same way also we the Arameans, that is to say the Syrians…"
_"The Syriac language, that is Aramaic"
_"It appears that the south was so named also by us Arameans. But as for the north, it is not known to us why it was called (such) by the ancient sons of Aram." _"But in the manner of speaking (of) the Arameans, (some) people call them chirping gadflies." Z اللغة السريانية, أي اللغة الآرامية". Z ويبدو أن الجنوب كان يدعى من خلالنا نحن الآراميون ولكن بخصوص الشمال، ليس معروفا لنا لماذا أطلق عليه أبناء آرام الأولين (هذا) الإسم ". Z " ولكن بعض الناس يُشبِّهون طريقة حديث السريان، بغناء ذبابة الحصان"
7. The Anonymous of Zuqnin, near Amid [Turkey] writes in his Syriac world-chronicle of c. AD 775 regarding the year 504-505: "The year eight hundred and sixteen: The Romans devastated all the Persian territory from Nisibis to the boundaries of Beth Aramaye, killing, destroying, taking prisoner and plundering." 7. كاتب من زوقنين (مجهول الإسم) ، بقرب أوميد [تركيا] يكتب في تقريره (وقائع العالم) بالسرياني من نحو 775 ميلادية عن السنة 504-505 : "عام ثمانمائة وستة عشر : الرومان دمروا جميع الأراضي الفارسية من نصيبين إلى حدود بيت آرامايى، بالقتل والتدمير والسلب والنهب والسجن"
7.1 About the imposator appeared in the West and seduced and killed many among the Jews he says[7.1]: "He went down to the land of Beth Aramaye that was immersed in all the evils of sorcery, and devoted himself to sorcery and all diabolical tricks." 7.1 عن مخادع ظهر في الغرب ،أغوى وقتل العديد من اليهود يقول[7.1]: ذهب إلى داخل أرض بيت آرامايى، التي كانت مملوءة من جميع شرور السحر، وكرّس نفسه للسحر والحيل الشيطانية "
7.2 In relation to Jazira, the term which refers to Upper Mesopotamia from Osrhoene in the West to Mount Sinjar in the East, being the land of the Syriac-speaking Christians we read [7.2]: "land which spoke the language of the children of Aram"
7.3 About the Arab Muslims who married Christian women we read[7.3]: "As for the people who married (Syrian) women, sired Syrian children, and mixed with the Syrians, and whom no one was able to distinguish from the Aramaeans, he quickly found out about them." 7.3 عن العرب المسلمون الذين كانوا يتزوجون نساء المسيحيين نقرأ[7.3]: أما بالنسبة للشعب الذي تزوج بالنساء السريانيات، وَلدواأطفالاً إنخلطوا مع السريان وليس أحداً إستطاع أن يميِّزهم من الآراميين، إنه سريعا اكتشف عنهم". 8. الراهب أنطون من تكريت (العراق،† 840-850) يقول عن وفاء الآرامي:" الوزن الخامس من الشعر عادة يتألف من ستة او سبعة آيات، الذي عدده أحيانا يكون الزيادة أو النقصان وهذا الوزن يَعود إلى رجل يدعى الفيلسوف وفاء الآرامي". "وقال أيضا مار فيلوكسينوس أن ترجمة الكتاب المقدس هي ما تسمى الفشيطة(Peshitta) "، التي قاموا بترجمتها أجولاس وسومخوس"
10. Dionoysius Bar Salibi the Syrian-Orthodox bishop of Amid (Diyarbekir, Turkey, †1171), also called the star from the 12th century, says in his book ‘Against the Armenians" : "The Armenians say: "From whom do you descend - you who are Syrians by race?" Against them we will say: Neither do you know from whom you descend....It is we (Syrians) who have enlightened your authors and revealed to them that you are descending from Togarma....As to us Syrians, we descend racially from Shem, and our father is Kemuel (the) son of Aram,…… and from this name of Aram we are also called sometimes in the books by the name of "Arameans". وبسبب هذا الاسم 'آرام' أيضا ندعى أحيانا في الكتب آراميين". _"Not even the name "Syrian", which you've taken from us is higher, because this name is derived from "Suros", who reigned in Antiochia and after his name the country of Syria was named, like your national name derived from the pagan ‘Yawan’." _"If Yawan, the father of the Greeks, was born before Aram, our father, there might have been occasion for discussion..."
_. "As we Syrians are the children of Aram." "We show that our name has more honor than yours." Z وأضاف "إذا ياوان (Yawan)، أبو اليونانيين، وُلد قبل آرام أبونا، ربما سيكون هناك فرصة للمناقشة..."
10.2 On the Greeks he says “ [10.2]: "Because of hatred they (the Greeks) call us Jacobites instead of Syrians and we answer and say that the name Syrian by which you do not call us anymore does not rank before the honorable name because this name is derived from Syrus, who ruled over Antiochia and after him the land was named Syria...however we are the descendants of Aram and from his name we were called in ancient times by the name "Arameans"
لنا يسمونا يعقوبيين بدل ما يُسمّونا السريان ونحن نجيبهم ونقول: إن إسم السوريين الذي أبطلتم تسميتنا به يُحسب كإسم مشرّف لنا لأن هذا الاسم مشتق من سوروس Syrus ، الذي حكم على أنطاكية Antiochia حيث سميت سوريا هذه الأرض على اسمه. ولكن نحن من نسل آرام ومن قبل هذا الاسم كنا ندعى في العصور القديمة آراميين". 11. The Syrian-Orthodox Patriarch St. Michael the Great of Militene (Malatya, Turkey, † 1199 AD) says about the children of Shem: "The Children of Shem are the Assyrians, the Chaldeans, the Ludians and the Arameans who are the Syrians, the Hebrew and the Persians." 11. بطريرك الكنيسة السريانية الأرثوذكسية ميخائيل الكبير من Militene (ملاطية، تركيا، †1199م.) يقول عن أبناء سام : أبناء سام هم الآشوريون والكلدان واللوديون والآراميون أي هم السريان واليهود والفرس". _“The kingdoms which have been established in antiquity by our race, (that of) the Aramaeans, namely the descendants of Aram, who were called Syrians” . _“The Arameans then, whom the Greeks call Syrians, took hold of Aram." Z "الممالك التي أنشئت في العصور القديمة من جانب عرقنا، (أي) الآراميين، وهم من نسل آرام، ودعيوا السوريين..."
Z " الآراميون، الذين كان اليونانيون يسمونهم سريان، كانت سلطتهم مستقرة في آرام". 11.2 About Mani he says[11.2]: "He (also) sent from among those who were with him [the apostle] Adai so as to preach in Beth Aramaye." 11.2 عن ماني يقول[11.2]: "أرسل أيضا من بين أولئك الذين كانوا معه (الرسول) آداي وذلك للتبشير في بيت آرامايى"
عن اضطهاد المسيحيين في بلاد فارس في 339-379 يقول : "".. 40 عاما من دون انقطاع كان إضطهاد في أرض الآراميين"
11.3 About the war between the caliph Al Mamoun of Baghdad and Mohammed he says: [11.3] "Because stones were not to be found in Baghdad, just as there were not any in Beth Aramaye, they ended up in breaking the columns which they had taken down from the churches, and they were throwing them into the (ballistic) machines." في النهاية كسروا الأعمدة التي هدموها (أنزلوها) من الكنائس، وكانوا يطرحونها بآلات باليستية(ballistic) ". 12. The well known Syrian-Orthodox Maphrian and scholar Bar Hebreaus from Militene (Malatya, Turkey, †1286), by the modern scientist called the library from the 13th century because of his profound knowledge, says in his Book of Rays: . _"You have not corrupted me in the barbaric, pagan astrology, but [instead] You have brought me to the eloquent Aramean-Syrian nation." _"From Aram, that is Syria, we are saying Aramean [...], that is to say Syrian and from Aram, which is Harran, the city of the pagans, we are saying pagan [...] The East Syrians do not know the first one and read in the 2nd Book of Kings (18:26) 'speak to your servants in the Aramaic language' [...] and it is obvious that the scripture demands here 'Syriac' and not 'pagan'. And in Paul's Epistle to the Galatians [2,14] they read 'if you who are a Jew, live like a pagan' [...] and it is obvious that the scripture demands here 'pagan' and not 'Syriac'. Z "أنتم لم تفسدوني في وحشية علم التنجيم الوثني بل بالعكس جلبتموني إلى الأمة الآرامية- السريانية البليغة". Z " من آرام، أي سوريا، نقول آراميين [...] معنى السوريين السريان وأيضا من آرام، أي حران، مدينة الوثنيين، نقول وثني [...] السريان الشرقيين ليسوا معروفين في كتاب الملوك الأول ونقرأ في الكتاب الثاني من الملوك (18:26) 'تكلم إلى عبيدك في اللغة الآرامية'... ومن الواضح أن المقصود هنا 'السريانية' وليس 'الوثنية'. وفي رسالة بولس إلى أهل غلاطية2:14)) يقرأون "إن كنت وأنت يهودي تعيش أمميّا "... وهو واضح أن الكتاب يقصد هنا وثني وليس سرياني". 12.1 In his book of the laughable stories, he says [12.1] "let this book be a religious friend to the reader, whether he be Muslim, or Hebrew, or Aramean, or a man belonging to a foreign country." 12.1 في كتابه القصص الهزلية، يقول [12.1]:... "دعوا هذا الكتاب أن يكون صديق ديني إلى القارئ ، سواء كان مسلم ، أو يهودي، أو آرامي، أو رجل ينتمي إلى بلد أجنبي"
12.2 In his commentary on Genesis 10:22 he says[12.2]: "and his [Shem] sons (were) the Assyrians, the Chaldeans, the Ludians, the Syrians, the Hebrews, (and) the Persians." 12.2 وفي تفسيره لسفر التكوين 10:22 يقول[12.2]:"... وأبناء سام هم الآشوريين، الكلدان، اللوديين (Ludians)، السريان، واليهود (و) الفرس". _"Aram is Inner Syria, that is Palestine, while outside of Syria is called Aram-Nahrin." _“The Syriac tongue is from Aram the son of Shem the son of Noah; the name is transmitted in Aramaic." Z آرام الذي في داخل سوريا هو فلسطين، بينما خارج سوريا يدعى آرام ما بين النهرين". Z " اللغة السريانية هي لغة آرام ابن سام، ابن نوح، الإسم أحيل في الآرامية"
12.4 In his book "Storehouse of Secrets" [12.4] he says: "That is, that the Syriac was the first tongue, and not the Hebrew as some think, is known from this, that Abraham was first called Hebrew because of the crossing of the river Euphrates"
12.4 في كتابه "مخزن الأسرار" [12.4] يقول: "وهذا هو، أن السريانية هي اللغة الأولى، وليس العبرية، كما يعتقد البعض، ويُعرف من هذا، أن إبراهيم كان أول من دعي عبرياً بسبب عبور نهر الفرات"
_"The Arameans don't want to mix with the pagans." _"Wash my tongue with hyssop, so that they speak in the Aramaic language in the measure of Ephraem, because this is the Syriac way of speaking, which foreigners do not use." Z الآراميون لا يريدون أن يخلطون أنفسهم مع الوثنيين"
Z "اغسل لساني بالزوفا، ذلك لأنهم يتكلموا في اللغة الآرامية على وزن مار أفرام، لأن هذه هي طريقة الحديث السريانية ، التي لا يستخدمهاالاجانب". 12.6 In his book “Summary of the Nations”: [12.6] "The language of all mankind was one, the Syriac, and it was divided into three parts. The clearest was Aramaic." إن لغة البشر كانت واحدة، وهي السريانية، وأنها كانت مقسمة إلى ثلاثة أجزاء، وأكثر وضوحا كانت الآرامية"
13. 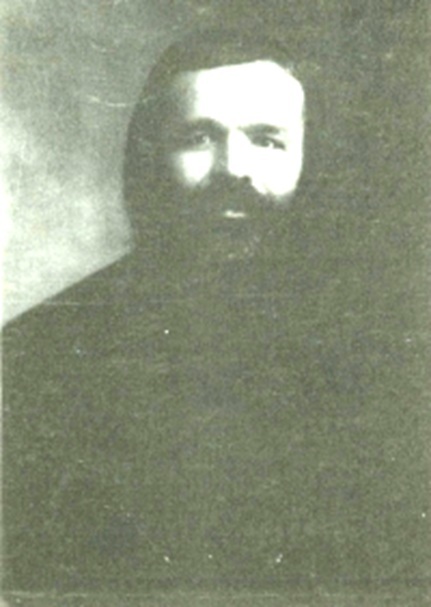 The Great Metropolitan Philoxenos Yuhanun Dolabani (1885-1969), born in Mardin [Turkey], was one of the outstanding scholars that the Church has seen in the near past. He wrote many books, in which he expressed his relationship with the Aramaeandom. In his hymn  "Love towards the Aramaeandom" he says: "Because of love towards you, O Aramaeandom, I have been deeply in love since childhood. During weakness and strength I will serve you faithfully." 13. المطران العظيم مار فيلوكسينوس يوحنا دولاباني (1885-1969)، ولد في ماردين (تركيا) وهو واحد من عمالقة العلماء الذي شهدته الكنيسة في الماضي القريب. وكتب العديد من الكتب، وصف فيها علاقته بالآراميّة. في ترتيله "حب للآراميّة" يقول : "من أجل حبّي لك، يا آراميّة أنا منذ الطفولة متعمقا في حبّك. في ضعفي وقوتي سوف أخدمك بأمانة". 13.1 In his book of the bee, written 1914 in the monastery of Deyrulzafaran [Turkey] [13.1] he says on Arameans and Aramaic: "My dear and beloved Aramean, in many ways I am indebted to you on account of the racial love of Adam and the Semitic one of Aram (that burns in my heart)." "I think, my dear one, . . . that you long for the Aramaic tongue, the tongue which my ancestors spoke – the lordly and ancient language. That (language) in which our Lord spoke when he was dwelling on the earth." 13.1 في كتابه النحلة، كتبه عام 1914 في دير الزعفران (تركيا)، يقول عن الآراميين واللغة الآرامية[13.1]: "عزيزي وحبيبي آرام، في نواح كثيرة أنا مدين لك بسبب أنّ الحب العنصري لآدم وسامية آرام (مشتعل في قلبي)". أعتقد، يا عزيزي،... أنك كنت مشتاقا للغة الآرامية، اللغة التي تكلم بها أجدادي- اللغة الربانية والقديمة. (اللغة) التي تكلم بها ربنا عندما كان يعيش على الأرض". لا تتكلم كثيرا، ولا تتفوه بكلمات الحكمة. لأن مخافة الله ومحبة البشرية نابعة من الآراميين". 13.6 بفضل مساعدة ربنا لقد وصلتُ إلى نهاية المطاف. 13.7 In Bar Hebraeus' "Book of the Dove" written by Dolabani in the monastery of Deyrulzafaran in 1916, he says [13.7]: "To you our Aramean reader is this book dedicated, bearing (many) advantages." 13.7 في إبن العبري (Bar Hebraeus) "كتاب الحمامة" الذي كُتب على يد المطران دولاباني في دير الزعفران في عام 1916، يقول [13.7]: قارئنا الآرامي لك هذا الكتاب ُكرِّس، وهو مفيد جدا، وله عِدّة مزايا". 13.8 In Bar Hebraeus' book "Mush'hotho" written by Dolabani in 1929 in the monastery of St. Marc in Jerusalem, he says [13.8] : "Bar Hebraeus has left to the Aramaeandom an incomparable preface whose propositions are excellent;"
13.8 في كتاب إبن العبري (Bar Hebraeus) "موشحوثو" كتب على يد مطران دولاباني في عام 1929 بدير مار مرقس في أورشليم يقول [13.8]: ابن العبري ترك مقدمة للآراميّة لا شبيهَ لها، بها مقترحات ممتازة". 13.10 In the book of the poems of Patriarch Yuhanon Bar Ma‘dani written in Jerusalem in 1929, he says [13.10]: "For the benefit of those who love the Aramaeandom, we were careful to publish this book of memre and verse homilies of Mor Yuhanon Bar Ma‘dani." لمصلحة الذين يحبون الآراميّة كنّا نحرص على نشر كتاب الشعر هذا والمواعظ الشعرية ليوحنا ابن معدني"
13.11 In his poem of mourning about the death of Naum Faik († 1930) [13.11]: "He was a trombone who raised his voice for our nation and because of the Aramean language of our fathers he did not stop blowing in our group." 13.11 في قصيدته المحزنة عن وفاة نعوم فايق (1930†) [13.11] يقول: هو كان البوق، الذي سمّع صوته لأمتنا وبسبب الآرامية لغة آبائنا أنه لم يتوقف عن الهتاف في مجموعتنا". 13.12 In the book of the letters of David Bar Faulus, which he wrote 1953 in Mardin [13.12] : "All who love the Aramaeandom are eager to familiarise themselves concerning his instruction." جميع الذين يحبون الآراميّة هم متحمّسون (توّاقون) لمعرفة أنفسهم فيما يتعلق بالإطلاع على تعليماته". 13.14 In the book of the poems of Patriarch Noah, written 1956 in Mardin, he says [13.14]: “That it may it be immediate gain in the hands of those who love Aramaic learning." "See, I offer it today as a tasteful gift to those who love Aramaic learning." "أنه سوف يكون الربح فوري في أيدي الذين يحبون تعلّم الآرامية"
"انظر، أقدمه (أعرضه) اليوم باعتباره هدية لذيذة للذين يحبون تعاليم الآرامية "
13.16 In the history book of the anonymous from Urhoy about the afflictions in Edessa, Amid and Mesopotamia, written in 1959 in Mardin, he says [13.16]: "We loved to disseminate it in Syriac, in the language of its author, so that we might render service with good pronunciation to our own Aramaic language, and to the writers of our own regions of Mesopotamia, Nisibis, I mean, and Amid, and Urhoy and the rest." 13.17 In the book of the wisdoms of the Aramean sage Ahiqar written in 1962 in Mardin, he says [13.17]: "The primacy of the ancient writings in the Aramaic language is undeniable, because before all languages its culture advanced and its wisdom was disseminated." " للكتابات القديمة في اللغة الآرامية أهمية كبيرة لا يمكن إنكارها، لأن ثقافتها المتقدمة وحكمتها كانت منتشرة قبل كل اللغات"
وعندما الآراميون اعتنقوا المسيحية، نسوا إسمهم الآرامي، ودعيوا سريان ليميزوا أنفسهم عن الآراميين الوثنيين"
14.1"الأمّة السورية (السريانية) تتشرف بأن تنتمى إلى آرام...."
15. 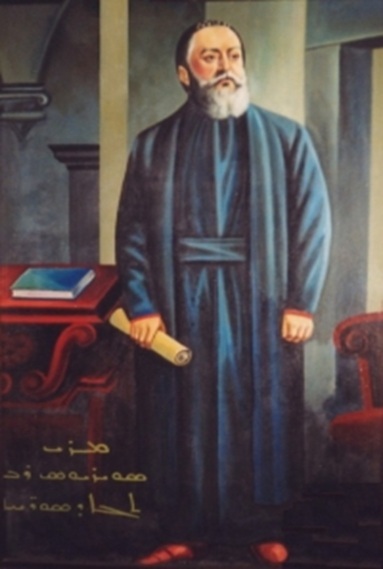 Ishak Bar Armalto, born 1879 in Mardin [Turkey] and passed away in 1954 in Beirut [Lebanon], made significant contributions to Syriac studies and had a profound knowledge of the syriac manuscripts. He also wrote a book about the Genocide on the Arameans in 1919. _"Discourse on the glorious deeds of the Arameandom"
Z . الحديث عن الأفعال الآراميّة المجيدة"
_. "Let us arrive to … so as to examine and talk about the exalted glorious deeds and the beautiful virtues of the Arameandom and raise and build our foundations on the foundations of her wise teachers and eminent scribes." Z دعونا نصل إلى...لنبحث ونتحدث عن الأعمال المجيدة والمحترمة وكذلك عن الفضائل الجميلة للآراميين ونرفع ونبني مجتمعاتنا على أساس المعلمين البارزين المملوئين حكمة ". _"And these [aforementioned] things altogether complete the Arameandom, [which is] rich in treasures." Z " وهذه الأشياء المذكورة أعلاه مع بعضها جميعا تجعل الآرامية كاملة، وهي غنية في الكنوز"
_"Since man can conquer and be conquered, it follows from this that language, too, can exalt and be exalted, although the Aramaic literature is in many and various ways more precious and excellent than the rest of the languages." ويستنتج من ذلك أن اللغة، أيضا، يمكن أن تُمجِّد أو تتمَجَّد ورغم أن الأدب الآرامي طرقه مختلفة، له قيمة ممتازة أكثر مما لبقية اللغات". _"Aramaeandom has other achievements and is adorned by other splendours. When the human race multiplied on earth and became involved in experimenting in various sciences and crafts, they managed to devise writing, and these same Arameans were the first to achieve renown in this: they put into written records their practices, customs and new discoveries. It was from them that the Phoenicians, Greeks, Romans and Egyptians learnt, and then taught other peoples. We also encounter the splendid and distinctive accomplishments of Aramaeandom when reflect and realize that from the Greeks the Syrians first took over learning and knowledge through the labour of their hands and the sweat of their brow; then, without wearying, and without receiving any reward, they transmitted it to the Arabs, and from them the Latins wisely took it over in a surreptitious way." Z الآراميّة لها إنجازات أخرى وهي مزينة من روائع أخرى. لقد إحتفظوا بمحاضر مكتوبة فيها ممارساتهم، وتقاليدهم واكتشافاتهم الجديدة، ومنهم قد تعلم الفينيقيين واليونانيين والرومان والمصريين وبعد ذلك علموا الشعوب الأخرى. وأيضا، دون ملل، ودون الحصول على أي مكافأة، وأنهم أحالوها إلى العرب، ومنهم أخذها اللاتين فاستولوا عليها بحكمة وبطريقة خادعة". Z وأنت، يا حبيبي الآرامي وصديقي، أنت بحاجة إلى أن تتعلم قراءة هذه اللغة وتُطوِّر نفسك فيها لاحتضان نَفَس آبائك والإتساع سعة أجدادك"
16.1. "The Arameans are the sons of Aram, son of Shem. They settled since old times in the large Aramean countries which were stretched from Persia in the East, and from the Mediterranean in the West and Armenia and Asia Minor in the North and Arabian Peninsula in the South. Their lands were Bayblon, Assyria, Mesopotamia, Syria, Lebanon, Palestine." 16.1 الآراميون هم أبناء آرام، إبن سام. إستوطنوا منذ العصور القديمة في بلاد آرام التي تمتد من بلاد فارس في الشرق إلى البحر الأبيض المتوسط في الغرب وأرمينيا وآسيا الصغرى في الشمال وإلى شبه الجزيرة العربية في الجنوب. 16.2. "The Arameans were in Aram which was from Persia to the Mediterranean, and they all were called Arameans, but when the Greeks seized the area they called it Syria." 16.2 الآراميون كانوا في آرام الذي كان يمتد من بلاد فارس إلى البحر الأبيض المتوسط، وكانوا يُدعون جميعهم آراميين، ولكن عندما اليونانيون إستولوا على المنطقة، دعوها سوريا"
17. 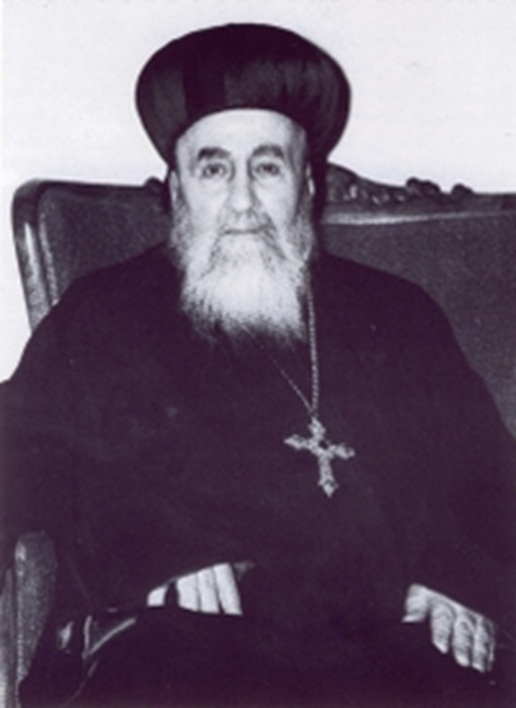 Paul Al-Khoury Al-Kfarnissy (1888-1963) was professor of Syriac at the Lebanese Maronite Order. _"The Arameans are the sons of Aram...their country is the area stretched from Persia in the east, from the Mediterranean in the west, from Armenia and Minor Asia in the north, and from Arabia in the south." _"After they became Christians the Arameans began leaving their old Aramean name to call themselves Syrians...I wish they had never changed their old Aramean name." _"Now I seek you, the children of Aram, what ever is your church denomination to remember your high origin and glorious history and to take care of your noble language..."
17. بولس الخوري الكفارنيسي (Kfarnissy) (1888-1963) كان بروفيسوراً عالماً في اللغة السريانية في دير المارونيين في لبنان. كتاباته غير المنشورة تشمل تاريخ أدب السريان. Z " الآراميون هم أبناء آرام... وبلدهم هو: المنطقة التي تمتد من بلاد فارس في الشرق إلى البحر الأبيض المتوسط في الغرب، ومن آسيا الصغرى وأرمينيا في الشمال إلى شبه الجزيرة العربية في الجنوب"
Z والآراميون بعدما أصبحوا مسيحيين، بدأوا ترك إستخدام إسمهم الآرامي القديم ، ودعوا أنفسهم سريان.... كنتُ أتمنى أن لا يُغيِّروا أبدا اسمهم (الآرامي) القديم"
18. Agapius of Hierapolis/Mabbug [Iraq] was a 10th century bishop. His world History features accounts of the world from its creation to the year 941/942. He Says about king Syrus: "At that time [42 years after Moses was born] lived King Syrus. His rule was in Damascus. Syria was called by his name." 18. أجابيوس من حيرابوليس / مابّوغ (العراق) كان مطران من القرن العاشر. كتابه "تاريخ العالم" يعطي لمحة عامة من إنشاء العالم حتى سنة 941/942  يقول عن الملك سيروس: وفي ذلك الوقت (42 عاما بعد ولادة موسى) عاش الملك سيروس. وكان حكمه في دمشق. وسوريا دعيت على اسمه". [1.2] (C.W. Mitchell, S. Ephraim's Prose Refutations of Mani, Marcion and Bardaisan (2 vols. ; London & Oxford: Williams & Norgate, 1912 & 1921), vol. II, p. 225. See Joseph P. Amar, A Metrical Homily on Holy Mar Ephrem by Mar Jacob of Sarug (Patrologia Orientalis, vol. 47, fasc., 1, no. 209; Turnhout: Brepols, 1995), #48, pp. 37ff. The East-Syrian Chaldean church of Babylon. 1.1. "And from Khuzestan [ancient Elam] he [King Shapur II] wrote an edict to the rulers of Beth-Oromoye"
1.2. "These (things) were written by King Shapur [II; 309-379 AD] from Khuzestan to the rulers of Beth-Oromoye." 1.3. "But that deceiver also came to [the city of] Mahuze, which belongs to Beth-Oromoye, and he deceived myriads of Jews." 1.3 . لكن ذلك المخادع جاء أيضا إلى (مدينة) ماهوز التابعة إلى بيث أورومويى وخدع كثيرين من اليهود. 1.4. "Then, suddenly, a third edict sent by King Shapur [II; 309-379 AD] from Khuzestan came to the rulers of Beth-Oromoye." "Following after ‘Ebed Mešiha was the blessed Hairan, who was from Beth Aramaye. .. In his time were many wars between the Romans and Parthians. And an Artabanus112, the grand king of the Parthians, pushed into the land of the Romans. And he set ablaze many cities of Beth Aramaye. …And in earlier times the Persians sought to pounce on the throne of the Parthians, and many times they tested their power in battle … First they fell on Mesopotamia, on Beth Aramaye, on Beth Zabdai and Arzun." 2.1. عن سيرة مطران حيران من أربيلة (225-258 م.) يقول:" تباعا بعد عبد مشيحا كان حيران المبارك الذي أصله من بيث آرامايى (=أورومويى). في وقته كانت عدّة حروب بين الرومان والفرس. وأرتابانوس 112، الملك العظيم من الفرس توغل في داخل الأرضي الرومانية وأحرق عدة مدن من بيث آرامايى.... وفي أوقات سابقة حاول الفرس السعي للإنقضاض على عرش اليونان، ومرات كثيرة تدرّبوا على الصراع في ميدان المعركة... أوّلا هجموا على ما بين النهرين، على بيث آرامايى وعلى بيث زبداي وأرزون". 2.2. About Bishop Šahlupa of Arbela (258-273 A.D.) he says: "Following Hairan, who is worthy of honor among the saints, was Šahlupa, zealously caring and hard-working in fear of God. Also this holy father was from Beth Aramaye." 2.2. عن سيرة مطران صاهلوبا من أربيلة (258-273 م.) يقول:" خلف حيران، الذي يستحق التكريم بين القديسين، كان صاهلوبا مساعدا متحمسا وعاملا بمخافة الله . وأيضا هذا الأب القديس كان من بيت آرامايى". 2.3. About bishop Aha d-Abuhi of Arbela (273-291 A.D.) he says: "And in unanimity they both choose of the entire people Papa, the Aramaean, a smart and wise man." 2.3. عن سيرة مطران آخا دابوهي من أربيلة (273-291 م.) يقول: " واختاروه بالإجماع من بين جميع الشعب بابا الآراميين، رجلا ذكيا وحكيما"
3. سويريوس سيبوهكت، ولد عام 575 في نصيبين وتوفى عام 7/666، كان مطرانا في المدرسة المشهورة قنشرين (عش النسور). وهو (سويريوس) كان عالما لامعا. يقول عن الآراميين الذين صاروا مسيحيين: "لكن بعضا من السريانيين الذين دخلوا عميقا جدا في المسيحية كما باردايصان المعروف بالفيلسوف الآرامي". 4. 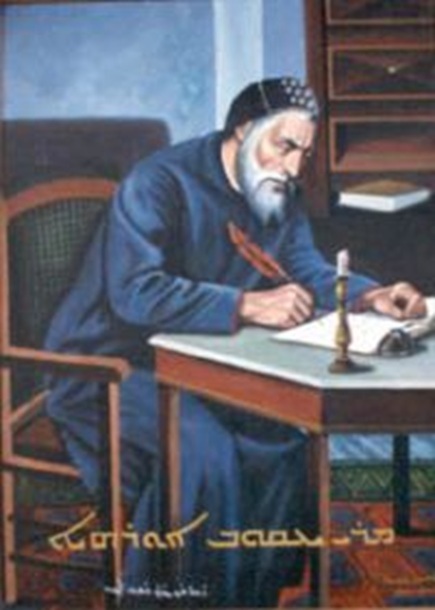 The Chronicle of Khuzistan (Iran), is written by an Aramean Christian from Khuzistan. The Syriac text is considered to be written around 680 A.D. About the realtion between Isho Yahb and King Khosrau II Parvez (598-628) of Perzia we read: "YeshuYahb was treated respectfully throughout his life, by the king himself and his two christian wives Shirin the Aramean and Mary the Greek". 4. وقائع (تاريخ) خوزستان ( إيران) كُتب على يد أحد الآراميين المسيحيين من خوزستان. النص السرياني يُعتقد أنه كتب في عام نحو 680 م. عن العلاقة بين إيشو ياهب والملك خوسرو II فارويز (598-628) من الفرس نقرأ: يشوع ياهب كان يعامل خلال حياته بكل إحترام من قبل الملك نفسه وزوجتيه المسيحيتين، شيرين الآرامية وماري اليونانية". "He interprets this [oracle] plentifully - i mean this multiform oracle - somewhere in Pethor of Aram-Nahrin"
6.1. About the history of Catholicos Babai we read: "Having been fulfilled, all the fathers chose an inhabitant of Seleucia, relative of the astrologer Mousa, and secretary of Marzban of Beth Aramaye. He was called Babai, son of Hormizd." 6.1. عن تاريخ مفريان باباي نقرأ: "مثلما جرى، جميع الآباء اختاروا أحد سكان سيلوسيا، وهو من أقرباء عالم النجوم موسى. وسكرتير مارزبان من بيت آرامايى كان يدعى باباي، ابن هورميزد"
6.2. About the History of St. Abraham the Great we read: "The daughter of one of the notables of Nisibis was possessed by a demon, who tormented her much. God wanted to manifest the virtues of Mar Abraham, the demon shouted by the mouth of this girl: 'Misfortune with me! 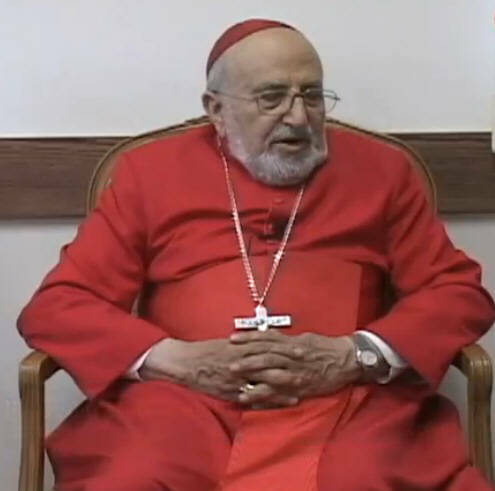 Here that this Aramean dressed in a coat and who lives in the School, drives me out and torments me.'" 6.3. About the history of Mar Aba the Great we read: "He was scribe of Marzban of Beth Aramaye, who lived in Radan." 6.3. عن تاريخ مار آبا الكبير نقرأ: "كان سكرتيرمارزبان في بيت آرامايى، الذي كان ساكنا في رادان". 6.4. About the History of Catholicos Joseph we read: "This man spend the greatest part of his life in the Greek empire, where he learned medicine. Back to Nisibis, he settled some time in a monastery and became attached to an Aramean king, who had then in this place the responsibility of Marzban." 6.4. عن تاريخ مفريان (كاثوليكوس) يوسف نقرأ: "هذا الرجل عاش الجزء الأكبر من حياته في الإمبراطورية اليونانية، حيث أنه تعلم الطب. أثناء عودته إلى نيصيبين استقر بعض الوقت في الدير وأصبح مرتبطا بملك آرامي، الذي كان لديه في ذلك الوقت مسؤولية مارزبان". 6.5. About mortality rate at the time of Joseph we read: "Here is an anecdote relative to this plague. The inhabitants of Beth Armaye were all removed by the death; there remained only seven persons and a young boy." 6.5. عن معدل الوفيات في زمان يوسف نقرأ: "هنا طرفة ذات صلة بالوباء). سكان بيت آرامايى أصابهم الفناء وبقي هناك فقط سبعة أشخاص وصبي صغير". 6.6. About History of Rabban Haia we read: “After Mar Abraham's death, Raban Haia went to the desert of Egypt and prayed to Jerusalem. The divine grace called him then to return to Aramean ground and to build a convent in the region of Cascar." 6.6. عن تاريخ الربّان هايا نقرأ: "بعد وفاة مار ابراهيم الأب هايا ذهب إلى صحراء مصر وصلى من اجل القدس. النعمة الإلهية دعته إلى العودة للأرض الآراميية لكي يشيد دير في منطقة كسكار". Mor Yeshu'zkho the Aramean, episcopos (from the city of) Seleucia…..
About the famous bishop Isaac the Syrian (or: Isaac of Nineveh† 700) he says,, This useful Mimro (sermon) of Isaak, the Syrian, is finished. His prayer be with us." 7. مفريان– بطريرك طيموثاوس الأول للكنيسة السريانية الشرقية (النسطورية) (ولد في هازّا (اربيل)، العراق، ♱823-1-9) يقول إلى مطارنة السريان الشرقيين الآخرين عن مطران مار يشوع’زاخو : "مار يشوع’زاخو الآرامي أسقف من (مدينة) سيلوسيا..... عن مفريان – بطريرك دوديشوع يقول: "مفريان (كاثوليكوس) دوديشوع الآرامي... عن المطران المشهور اسحاق السرياني (أو: اسحاق النينوي ♱ 700) يقول: هذه القصيدة (ميمرو) المفيدة من اسحاق السرياني قد انتهت، صلواته معنا". 8. Isho Barnun († 827) , who was taught by Mar Abraham bar Dashandad in the Upper Monastery at Mossul, succeeded Timotheos I as patriarch. He says: "Syria was thus called by the name of Syrus, who having killed his brother, reigned in Mesopotamia, and hence the whole region during his reign was called Syria. 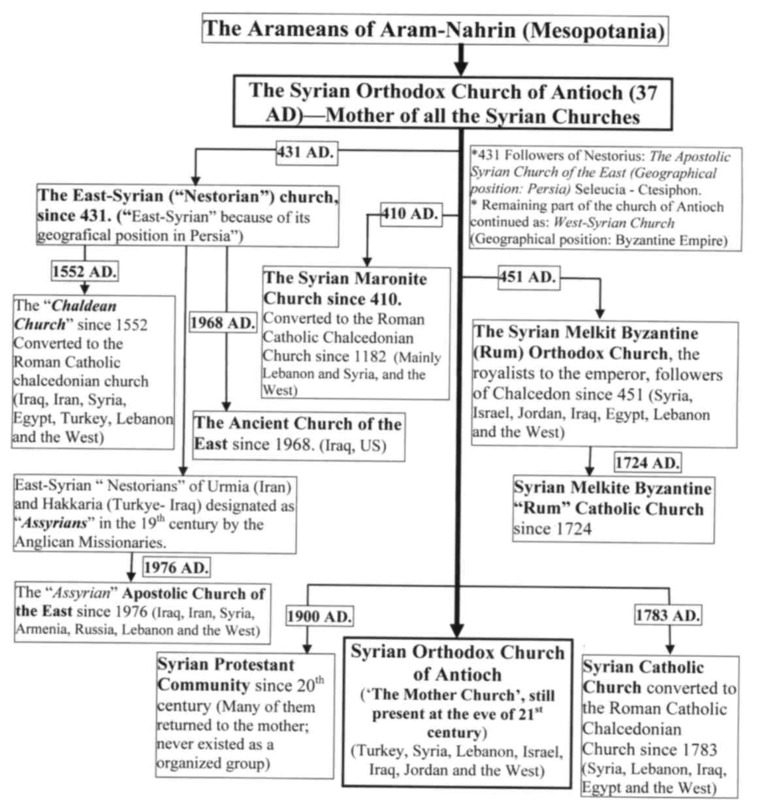 But in ancient times Syrians were called Arameans…. We know that the Aramean language in which Abraham spoke was the Syriac." 8. إيشو بارنون (827† ) , الذي تلقى تعليمه من مار ابراهيم بار داشانداد في دير العالي في الموصل، أصبح بطريركا بعد طيموثاوس الأول. يقول: "سوريا سميت على اسم سيروس، الذي بعد ما قَتل شقيقه ، كان يحكم بلاد ما بين النهرين ، وبالتالي دعيت المنطقة كلها خلال فترة حكمه سوريا. ولكن في العصور القديمة السوريين كانوا يدعوا آراميين. ونحن نعلم أنّ اللغة الآرامية التي كان يتكلم بها ابراهيم كانت اللغة السريانية". 9. ثئودور بار كوني (845† في سوريا) كان واحداً من اثنين وأربعين شهيدا من شهداء العموريون. في كتابه البيان يقول:  " ومن المفهوم أن إبراهيم كان سريانياً... لهذا السبب ابتعدت عن أصلها خلال قرون. وأيضا بسبب قبولها الكلمات الأجنبية وإذا نقارن اللغة البابلية مع اللغة السريانية الأصلية، سنرى أن حتى واحد بالمئة منها لا وجود له في اللغة السريانية. 10.1. "(By) Aram (the writing) means Harran. It is called Naharin, since (Aram), Urhoy/Edessa, Nisibis and Mahouze are called Nahrin and Beth-Nahrin." 10.1. "بكلمة آرام نقصد حرّان. الذي يدعى نهرين، لأنه (آرام) أورها /أدسّة، نصيبين وماحوزى تدعى نهرين وما بين النهرين"
10.2. "Abraham was indeed from Kashkar in Babylonia and the Babylonians are Arameans." 10.2. "ابراهيم كان بالحقيقة من كشكار في بابل والبابليون هم الآراميون"
10.3. "The Greek translation [the Septuagint] calls allways Aram and Arameans "Syriac". Consequently, Aram becomes the father of the Syriacs. 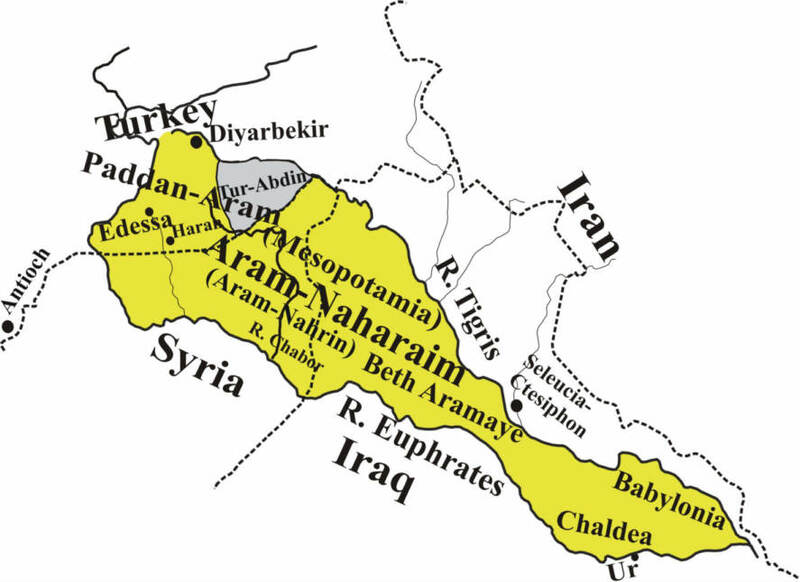 And from this name (of Aram), those living in Mesopotamia were called "Arameans". 10.3. "الترجمة اليونانية ]سبتوئكينت [Septuagint تسمّي دائما آرام والآراميي "السريان". ونتيجة لذلك يدعى آرام أبا السريان. ونسبة لهذا الإسم ( آرام)، دعي أولئك الذين كانوا يعيشون في بلاد ما بين النهرين الآراميين"
10.4. "Paddan is a city in Harran. Aram is Harran, and it is called sometimes Aram and sometimes Harran." 10.4. " فدّان هي مدينة في حرّان. آرام هو حرّان، ويدعى آرام وأحيانا حرّان"
10.5. "The Arameans are Harranites, but as a certain number (among them) had emigrated of Aram-Nahrin and had settled in Damascus, (city) neighbor of the people, for this reason this (last) place was also called Aram; and it is likely that Cousau also lived there. However, Théodule, explaining the words: Because of Aram, Ephraim and the son of Romalya agreed to harm you, says that Aram is the king of Damascus. " 10.5. الآراميون هم حرّانيون، ولكن بسبب عدد معين (منهم) قد هاجروا من آرام بين النهرين ، واستقروا في دمشق المدينة المجاورة لشعبهم ولهذا السبب دعيت دمشق أيضا آرام ومن المحتمل أيضا أن كوساو عاش هناك. ومع ذلك، ثئودولى، شرح الكلمات: بسبب آرام، اتفق أفرام وابن روملية ليسيئوا لكم ويقول أن آرام هو الملك دمشق"
11.1. 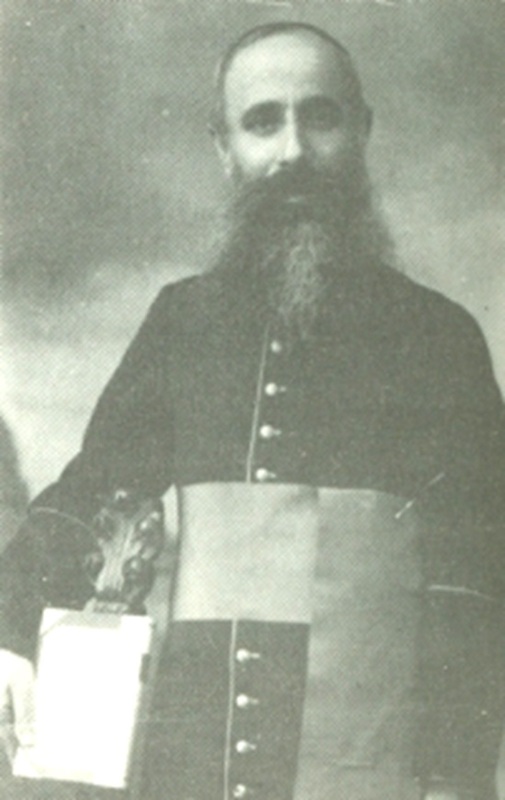 "Now when the blessed Mar George the Patriarch went up from the countries of Persia and Beth Katraye, because he had been absent there a long time, and because everything concerning him was a joy or a sorrow to this holy congregation, when all the holy Elders heard of his coming to the paternal throne of Beth Aramaye, they decided to send suitable men to meet him and to salute the father of fathers." 11.1. "حسنا، غادر البطريرك المبارك مار جورج بلاد الفرس وبيت كترايى، لأنه كان متغرّباً هناك لفترة طويلة ، وبسبب كل ما كان يتعلق به من الفرح أو الحزن لهذه الأبرشية المقدسة، وعندما استمع جميع الشيوخ الصالحين عن مجيئه الى العرش الأبوي في بيت آرامايى قرروا إرسال رجالاً محترمين لإستقبال وتحية أبا الآباء (البطريرك)". 11.2. "This blessed man came from the country of Beth Aramaye, and according to what I have learned from the ancients, he was a monk in this holy monastery." 11.2. "هذا الرجل المبارك جاء من بيت آرامايى وحسب ما تعلمته من القدماء، كان هو راهبا في هذا الدير المقدس"
11.3. "And on the episcopal throne of Salakh there shone with apostolic light the holy Bishop Mar Isho-zekha, who came from the country of Beth Aramaye;"
12. 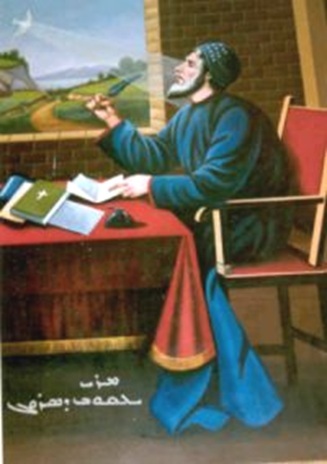 The East-Syrian “Nestorian” lexicographer Isho Bar Alii († 890)  was a pupil of Hunayn ibn Ishaq of Hira, the famous scholar, physician and scientist. Under the name "Aram" he writes: "Aram itself is Harran of Mesopotamia." About East- Syrians (Nestorians) he says: “"Eastern Arameans"
12. السرياني الشرقي "النسطوري" معجمي إيشو بار علي  (890♱) كان تلميذ هوناين ابن اسحاق في حيرة، العالم الشهير الطبيب والباحث. تحت اسم "آرام" يكتب : "آرام نفسها حران من بلاد ما بين النهرين"
عن السريان الشرقيون (النسطوريون) يقول: "هم الآراميون الشرقيون"
"The Greek translation [the Septuagint] calls all Aram and Arameans "Syrian". Consequently, Aram becomes the father of the Syrians. For this reason, those living in Mesopotamia were called "Arameans". 13. المطران يشوع’داد السرياني الشرقي "النسطوري" من حديثة (العراق 853♱) في كتابه "نور العالم"  يقول: "الترجمة اليونانية [= سبتواكينت Septuagint] تسمي كل آرام وكل الآراميين السريان"ونتيجة لذلك آرام هو أبو السريان. ولهذا السبب هم أولئك الذين كان يعيشون في بلاد ما بين النهرين وكانوا يدعون الآراميين". 14. The East-Syrian "Nestorian" lexicographer Bar Bahlul from Bagdad (†963) explains in his Syrian (Aramaic) dictionary  the name "Syria" as follows: "Syria was derived from Syrus, either during his lifetime or after his death. 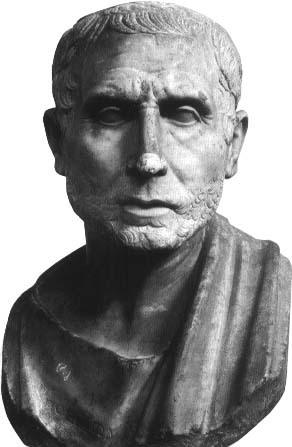 This Syrus had killed his brother and ruled over Mesopotamia. His whole kingdom was called Syria. The Syrians were formerly called Arameans, but when Syrus ruled over them, from then on they were called Syrians." 14. السرياني الشرقي "النسطوري" معجمي بار بهلول من بغداد (963†)  يوضح معنى الإسم سوريا في قاموسه السرياني (الآرامي) كما يلي: أن سوريا كانت مستمدة من سيروس، إمّا خلال حياته أو بعد وفاته. هذا سيروس كان قد قتل شقيقه وكان قاضيا على بلاد ما بين النهرين. وكانت كل مملكته تدعى سوريا. السريان السوريون كانو سابقا يُدعَون الآراميين، ولكن عندما سيروس بدأ يحكم عليهم دعيوا السوريون". 15.1 In his "History" the chronicler he writes [15.1]: "Abu Mansur Sa'id governed the territories of Beth Oromoye." ”Al-Hagag gave order so that the christians shall not install any churchleader, and the church of the Arameans' land remained without an overhead until the death of Hagag.” 15.1 في كتابه "تأريخ الوقائع" يكتب [15.1]: "أبو منصور سعيد كان يحكم على أراضي بيت أوروميى." وعن الحجاج يقول: الحجاج أعطى أمرا أن المسيحيين لا يجوز أن يرسموا لهم رئيسا للكنيسة وهكذا ظلت كنيسة بيت أرومويى دون رئيس حتى وفاة الحجاج". The year 664: " In which Mu'awia established Ziad, son of 'Obeia, governor of the Beth Aramaye (=Beth Oromoye) areas." "في عام 664 معاوية عيّن زياد ابن أوبيا حاكما لأراضي بيت آرامايى"
The year 695: "The church of Beth Aramaye remained without chief until the death of Heggag; this means for 18 years." "في عام 695 ظلت "كنيسة بيت آرامايى دون رئاسة حتى وفاة حجاج، أي ثمانية عشر عاما". The year 715: "In which Jezid, son of Muhallab, was established emir of Beth Aramaye." "في عام 715 يزيد ابن مُحلّب أختير أميرا لبيت آرامايى"
The year 720: "In which Omar, son of Hubeira, became emir of Beth Aramaye." في عام 720 عمر ابن حبيرة أصبح أميرا على بيت آرامايى"
The year 724: "In which Omar, son of Hubeira, was relieved of the Beth Aramaye emirate." في عام 724 عمر ابن حبيرة أعفِيَ من إمارة بيت آرامايى"
The year 745: "In which he established Omar, son of Hubeira, governor of Beth Aramaye. في عام 745 هو عيّن عمر ابن حبيرة حاكما على بيت آرامايى". ""And the knowledge of the whole star system, discovered by the Babylonian Arameans, that is to say the Chaldeans, those who in the south-east regions are growling because of the sandy soil in all their places and the unknown paths and roads leading from place to place and from city to city." 16. نظرية غاليلو غاليلي، عالم الفلك، أستِخدمت من قبل مطران الرها في القرن العاشر في كتابه المسمى "سبب كل الأسباب" الذي كان مصدرا غنياً ورائعاً. في هذا الكتاب أيضا ، نجد بالضبط نظرية نيتشه عن سوبرمان ويقول في أمور أخرى: معرفة النظام الكلي للنجوم أكتشِف من قبل البابليين الآراميين أي أنهم الكلدانيين. أولئك الذين كانوا في الجنوب الشرقي للمناطق المنهدرة بسبب التربة الرملية في جميع أماكنهم وعدم معرفة المسارات والطرق المؤدية من مكان إلى آخر ومن مدينة إلى مدينة. 17. The East- Syrian “Nestorian” bisschop Solomon from Basra says in his book,, The Book of the Bee”(written in 1222 AD) : "Touching the writing which was written in Greek, Hebrew and Latin, and set over Christ's head, there was no Aramean written upon the tablet, for the Arameans or Syrians had no part in (the shedding of) Christ's blood, but only the Greeks and Hebrews and Romans; Herod the Greek and Caiaphas the Hebrew and Pilate the Roman. Hence when Abgar the Aramean king of Mesopotamia heard (of it),,,,,,." "In the days of Reu the languages were divided into seventy and two; up to this time there was only one language, which was the parent of them all, namely, Aramean, that is Syriac." في أيام ريو(Reu) انقسمت اللغات إلى اثنين وسبعين لغة؛ حتى ذلك الوقت لم يكن هناك سوى لغة واحدة ، التي كانت أمّ جميع اللغات، وهي اللغة الآرامية ، التي هي السريانية". 18. The East- Syrian Chaldean Patriarch Joseph (1681-1695) from Diyarbekir (1683) wrote a liturgical book entitled,, The Holy Church of the Syrians of the East"
18. البطراك السرياني الشرقي الكلداني يوسف (1681-1695) من دياربكر كتب كتاب القداس  وهو يسمى ،، "الكنيسة السريانية المقدسة في الشرق"
19. Mor Touma Audo, born in Alqosh [Iraq] in 1855 and killed in the year 1917, was the Metropolitan of Urmia [Iran] and a famous dictionary writer. 19.1. "It is well-known by scholars, that the Syriac language was at that time the spoken language of the population, who lived in large numbers in the eastern areas, that is Syria, Beth Nahrin, Assyria and the land of Sinear and its environments. All these territories were called Beth Aram by the Jews, as it is revealed in the Old Testament. For Aram, the son of Shem, dominated over them and populated them with his offspring. That's why the Syriac language is not mentioned in the Old Testament, but Aramaic. That's the original and first name which is disclosed us..
19.1. المعروف جيدا من قبل العلماء ، أن اللغة السريانية كانت في ذلك الوقت اللغة المتحدّث بها من قبل السكان (أي اللغة العامية للشعب)، التي كانت منتشرة بشكلٍ واسع في المناطق الشرقية ، وهي سوريا ، بيت نهرين ، والإمبراطورية الآشورية، وبلاد سينيأر (Sinear) والمناطق المحيطة بها. 19.2. For the Christian doctrine prospered first in that part of Beth Aram, which was called especially by the Greeks Syria, and primarily prospered first in Antiochia, the mother of all cities, where the disciples were called Christians for the first time. 19.2. "لأن العقيدة المسيحية ازدهرت أولا في هذا الجزء من بيت آرام، الذي بشكل خاص دعي من قبل اليونانيون سوريا، وبصفة رئيسية ازدهرت أولا في أنطاكية ، أم كل المدن ، حيث دعي التلاميذ للمرة الأولى مسيحيين"
19.3. All the people from Beth Aram, who became christians, were called Syrians. 19.3. "جميع كل الناس من بيت آرام، الذين أصبحوا مسيحيون دعيوا السريان. 19.3. جميع الأبناء الذين هم من عرق آرامي، وخصوصا رجال الدين ، ينبغي أن يهتموا في تعليم وتدعيم اللغة الآرامية الثمينة". 20. Gevargis Abd- Ischo V, Patriarch of Babylon (1894-1899) says in a letter to his bishops , The general letter to the Syrian brothers who are called Nestorians. 20. البطريرك السرياني – الكلداني الشرقي كيوركيس عبد- إيشو الخامس في بابل (1894-1899) في رسالته إلى مطارنته يقول  : رسالة عامة إلى الاخوة السوريين الذين يطلق عليهم اسم النسطوريين". 21. Metropolitan Aday Sher, born 1867 in Shaqlawa [Iraq] and killed 1915 became the archbishop of Seert [Turkey]. 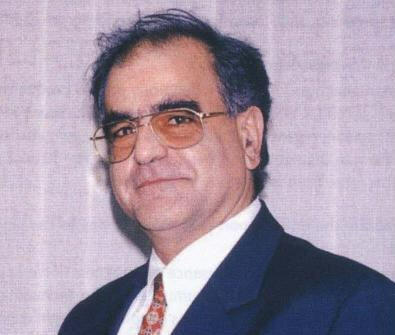 He writes in his book "Chaldo and Athur" : "They (= Syrians) were called Arameans due to their relationship with Aram, the son of Shem who settled in this country and populated it with his offspring." 21. المطران السرياني – الكلداني الشرقي أداي شير مواليد 1867 في شقلاوة (العراق) وقتِل في عام 1915 وكان مطرانا لسعرت (تركيا). انهم (=السوريون) دعيوا الآراميين بسبب علاقتهم مع آرام ، ابن سام الذي إستقر في هذا البلد مع ذريته واستوطنوا فيه. "The first inhabitants of Tur Abdin are the Arameans, for they inhabited the whole Mountain of Masios..."
22. 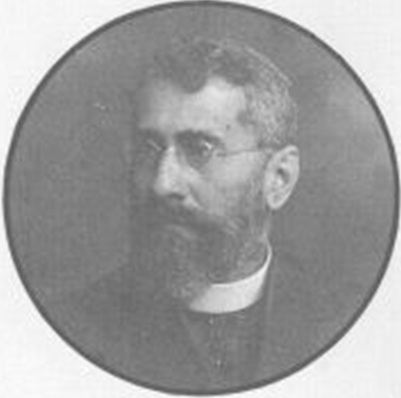 Ya‘qob Avgin (= Eugene) Manna (1867-1928) born in Beth Qopa [Iraq] was the Metropolitan of Basra [Iraq] and wrote many books (for example: In 1901 he wrote in Mossul a book called "Selected pieces of Aramean literature") and a dictionary Aramaic- Arabic. In his book "Beautiful gardens" he says: "All the East and West Syrians were called Arameans, that is to say children of Aram"
(على سبيل المثال : في عام 1901 كتب في الموصل كتاب "قطعة مختارة من الأدب الآرامي) وقاموس سرياني – عربي. في كتابه "الحدائق الجميلة" () يقول : "كل السريان الشرقيين والغربيين، سُمِّيوا آراميين؛ أي أبناء آرام". 22.1.1. "What induced us to dedicate to the mentioned topic a special chapter is to end the controversy between many Chaldeans and Syrians. Everyone of them claims the origin for himself and to be the older one, without having a reliable evidence or a funded scientific proof. In order to clarify the actualness of this problem and avoid the controversy, we say: All tribes, which lived in ancient times in the expanded countries, which were limited in the east by Persia, in the west by the Mediterranean, in the north by Asia Minor, by the countries of the Armenians and Greeks and in the south by the Arab peninsula, were known as children of Arams or as Arameans.."
22.1.1. إنّ ما حَمَلنا إلى إفراد فصل خصوصي للمواد المذكورة حُسِم النزاع الواقع فيها بين كثير من الكلدان والسريان. لكون كل منهما يَدَّعي الأصالة والقدميّة دون استناد على دليل راهن أو برهان علمي مكين. فبيانا لحقيقة الأمر ومنعا للمشاجرات نقول أنّ جميع القبائل الساكنة قديما في البلاد الفسيحة الواسعة المحدودة ببلاد الفرس شرقا والبحر المتوسط غربا وبلاد الأرمن وبلاد اليونان في آسيا الصغرى شمالا وحدود جزيرة العرب جنوبا كانت قاطبة معروفة ببني آرام أو الآراميين. 22.1.2. The countries of Babylon and Assur were at all times, even after the Arab conquest, called Beth Aramaye, that is countries of the Arameans. It is not necessary to demonstrate the innumerable testimonies in order to prove this fact; it is a truth, which is known for everybody, who has the slightest idea of the informations about the Church of the East, because the books of our ancestors are full of them. Likewise the countries of Mesopotamia were well-known as the countries of Arams. 22.1.3. You will realize from the mentioned testimonies here and also from others, that the inhabitants of Edessa and Jazira all of them were Arameans by nation and language. Regarding the dwellers of Syria, it is even more evident. 22.1.3. "فترى من الشواهد الموردة وغيرها أنّ أهل الرها والجزيرة بأسرها كانوا آراميين مِلّة ولغة. وأمّا سكان الشام (السورية) فالأمر أوضح من أن يبان"
22.1.4. You will receive testimonies of the church authors, who confirm this position. It became clear that all countries, which are known today under the designation Syrian is, whether in the east or in the west, were since time immemorial known as Aramean, and this is the correct designation. 22.1.4. "وستأتيك شهادات المؤلفين الكنسيّين إثباتا لذلك. فقد إتّضح إذاً أنّ جميع البلاد المعروفة اليوم بالسريانية سواء كانت شرقية أم غربية كانت معروفة في قديم الزمان بالآرامية، هذه كانت تسميتها الحقيقية". 22.1.5. The Syrian authors whether in the East or in the West, state that the term [Syrian] comes from Suros. Suros was a man of Aramean origin, who founded according to their opinion the city of Antiochia and conquered the countries of Syria and Mesopotamia. Following him these countries were called Syria and their inhabitants Syrians, as today the inhabitants of the Ottoman Empire are called Ottomans. 22.1.5. أمّا المؤلفون السريانيّون من الشرقيّين والغربيّين فيزعمون أنّ لفظة سوريا متآتية من سوروس وهو رجل من الجنس الآرامي، بنى على زعمهم مدينة أنطاكية واستولى على بلاد سوريا وما بين النهرين، ومنه سميت هذه البلاد سوريا، وأهلها سريانيين، كما يسمى اليوم جميع سكان المملكة العثمانية عثمانيين"
22.1.6. "The Syrians generally, whether from the East or from the West were not called Syrians in former times, but Arameans in dependance on their progenitor Aram, the son of Shem, the son of Noah. The name 'Syrian' dates from a time about 400 or 500 B.C." 22.1.6. أولاً: إنّ السريان عموماً شرقيّين كانوا أم غربيّين لم يكونوا في قديم الزمان يسمون سرياناً بل آراميّين نسبة إلى جدّهم آرام بن سام بن نوح. ثانياّ: إنّ اسم السريان لا يمكن أن يرتقي عهده عندهم إلى أكثر من أربعمائة أو خمسمائة سنة قبل التاريخ المسيحي. 22.1.7. "The term Syrian was adopted by the East-Arameans (Chaldeans and Assyrians) after Christ through the apostles, who had proselytized these countries." 22.1.7. ثالثا: إنّ اسم السريان لم يدخل على الآراميين الشرقيين (أي الكلدان والآثوريين) إلا بعد المسيح على يد الرسل الذين تلمذوا هذه الديار. 22.2.1. The refreshed meadow of the literature of the Arameans. 22.2.2. The guide of the Aramean Chaldean language. 23. 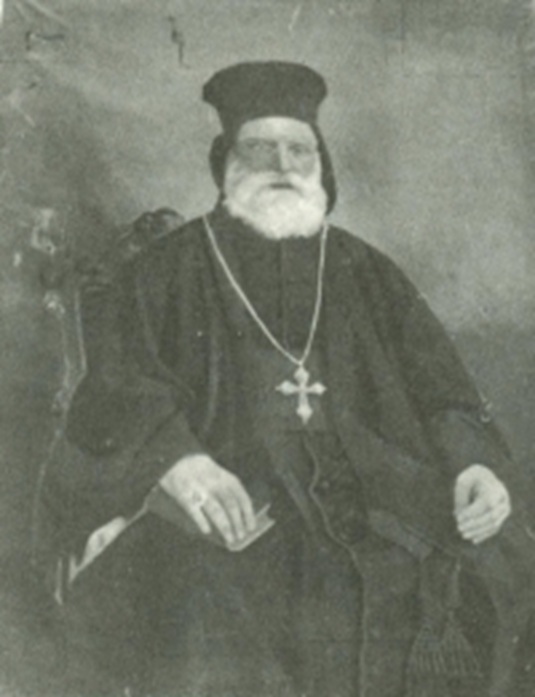 Bishop Israel Audo, born 6 Aug 1859 in Alqosh [Iraq] and passed away on 16 Feb 1941, was the brother of Touma Audo. 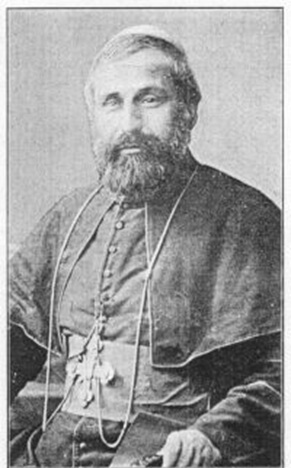 He was appointed as bishop of Mardin in 1909. 23. 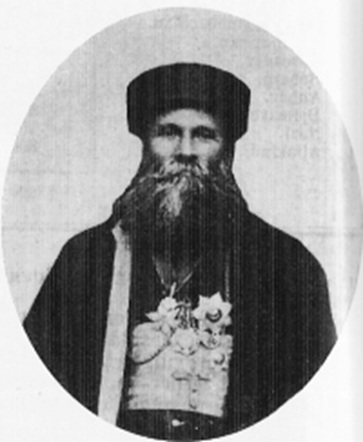 مطران إسرائيل عودو ولد في السادس من آب 1859 في ألقوش (العراق) وتوفي في السادس عشر من شباط 1941، كان شقيق توما عودو. رُسِم مطرانا لماردين في عام 1909. وكتب كتابا عن الإبادة الجماعية للآراميين الذي يسمى "كتاب إضطهاد المسيحيين الأرمن والآراميين في ماردين ، ديار بكر، سعرت، جزيرة-ابن عمر ونصيبين التي جرت في العام 1915" . Hanna Aydin, Die Syrisch- Orthodoxe Kirche von Antiochien, Ein geschichtlicher Uberblick” Bar Hebrraus Verlag Glane- Losser 1990, p.33-35. R. Duval (ed. ), Lexicon Syriacum, Paris, 1888-1901, under "Suryoyo"
How "Assyrian" fanaticism resulted in terrorism. 6-9-2014: Why are modern “Assyrians” very important to the illuminati Satanists? 5-7-2008: Assyria and Syria: Synonyms? What is the correct national name of the Modern Aramaeans? 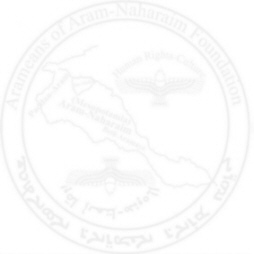 Why are there Aramaeans, who despite the fact that they speak Aramaic, insist on calling themselves 'Assyrians'? Why other Aramaeans stick to a third name, 'Chaldaeans'? Is it proper to use the name 'Syriac' that usually describes a late form of Aramaic language and scripture (from which Arabic derived) as national name of the Aramaeans? 13-5-2006: Is there an Assyrian cause in Iraqi Kurdistan? 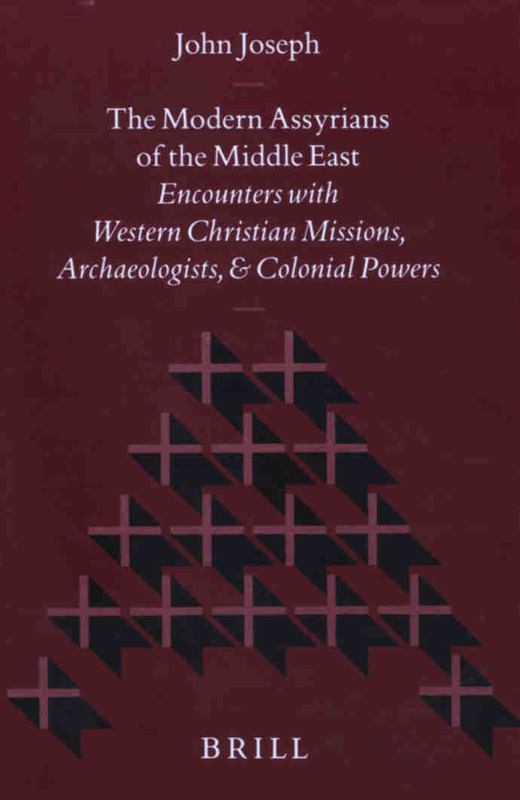 “The Church of the East and the Church of England: A History of the Archbishop of Canterbury's Assyrian Mission “ is the title of the book written by J.F. Coakley and published in 1992.